← How to print an invoice to PDF file? 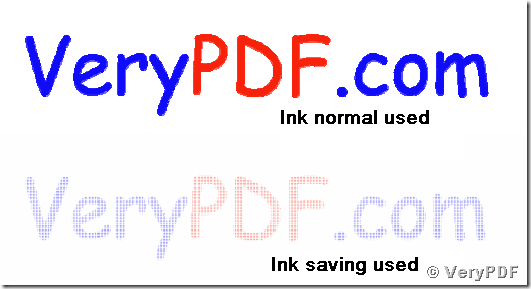 How to save ink when printing documents? The printer is flickering its alert LED light and printing “Low ink” status text on its LCD when you are going to print a large number of document sheets at the right moment, so what could you do? 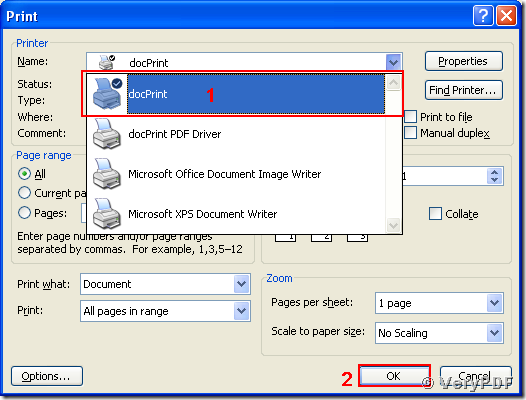 Here will present a method of saving ink for you using the docPrint Document Converter. The application docPrint Document Converter can save up to 75% of ink for printing any printable files. Meanwhile, an ink saving software is quietly appropriate for the environmental protection concept that is widely accepted in the modern world. 1. Open your doc document with MS Word application as normal and hit the shortcut key “Ctrl + P” in the MS Word interface. You will see a popup dialog box of “Print”. 2. 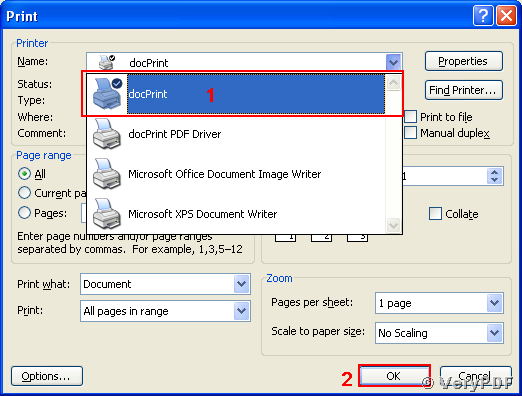 In the “Print” dialog box as displayed in the following snapshot, choose “docPrint” and press “OK” button in dropdown list of “Name”. Here comes the main window of application docPrint. 3.1. 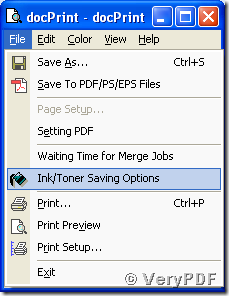 In the docPrint application window, follow the menu path “File –> Ink/Toner Saving Options” as displayed in the coming snapshot, and the “Ink Saving Options” dialog comes out. 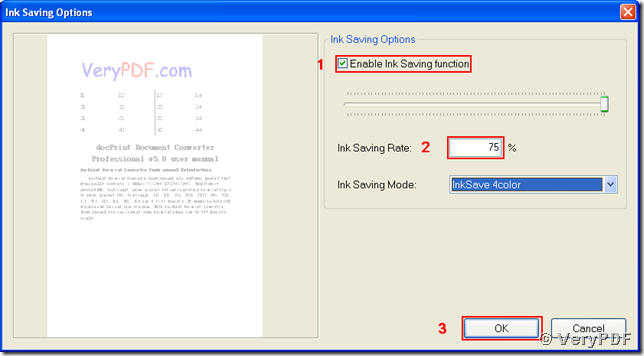 In the “Ink Saving Options” dialog as presented below, make the “Enable Ink Saving function” check box checked, input a number in the “Ink Saving Rate” textbox and then press “OK”. Ink saving function of saving 75% of normal used ink is activated now. 3.2. The next way to activate the ink saving function is clicking the “Ink Saving Options” button on the toolbar as shown in the next snapshot. This will activate the same “Ink Saving Options” dialog with that appeared in Step 3.1, and the remaining operations are the same as those of Step 3.1. 3.3. 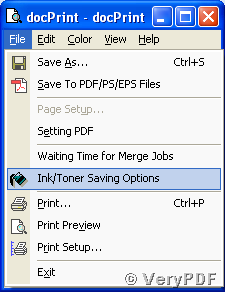 The third way to activate the ink saving function is to directly press the “0%”, “25%” or “50%” ink saving button on the toolbar as displayed in the snapshot below. 4. In the docPrint application window, follow the menu path “File –> Print…”, or use the keyboard shortcut “Ctrl + P”, or press the “Print” button on the toolbar. The print process will be started as normal and you can follow the procedures as before but print your documents with ink saving. 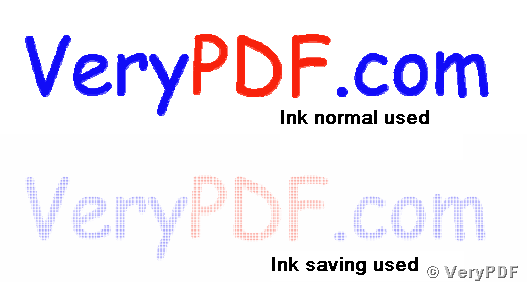 The following snapshot shows the difference between ink-normal-used effect and ink-saving-used effect, which shows that the function lightens the page color to save ink. Can I use PDFPrint Command Line to convert DOC file to PDF file? How to convert documents of Microsoft Office Excel to JBIG? How to combine several HTML files into one PDF file? How to run multiple concurrent instances of the software to convert documents to PDF files at same time? This entry was posted in docPrint Pro and tagged docPrint, document converter, save ink. Bookmark the permalink.